The White-faced Ibis is a medium size wading bird with a 3-foot wingspan. They can be found feeding in large flocks from just few birds up to a 10,000 birds, using their long sensitive bills to probe the shallow waters and mudflats, they inhabit, for their prey. White-faced ibis roost and build their nests in bushes or low trees usually over shallow water. This species is rare and unexpected in Tennessee, but occurs every couple of years. Description: Long neck with a dark, bronze-chestnut sheen body. The white-faced ibis has long pinkish-red legs and lore, decurved dark bill, reddish eyes, and a bare face with a line of white feathers separating the face from the forehead. In fall, a RED iris is a key identification marker. Voice: Deep goose-like nasal quack and multi-note “oink”. Glossy Ibis – Blue-gray lore, little or no red on legs, dark eye. White Ibis – Larger, heavier than all other ibis, broader wings, thicker, orange-red bill, white plumage with small black wing tips. Herons – have straight bills not curved bills. Habitat: In Tennessee, the White-faced Ibis can occasionally be found in freshwater wetlands, flooded hay meadows and agricultural fields. Diet: Earthworms, aquatic insects, crustaceans, newts, fish and frogs. 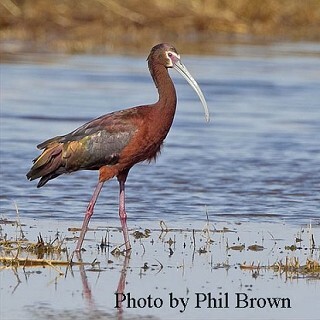 Status in Tennessee: The White-faced ibis is occasionally found in Tennessee in shallow water and freshwater wetlands, typically in western Tennessee. Males have longer bill and legs than females.